For my entire life, the concept of “normal” school sports seemed like the only option when it came to recreational activities, however, I steered clear of the entire idea of being on a sports team due to lack of confidence and skills with “ball and net” sports. 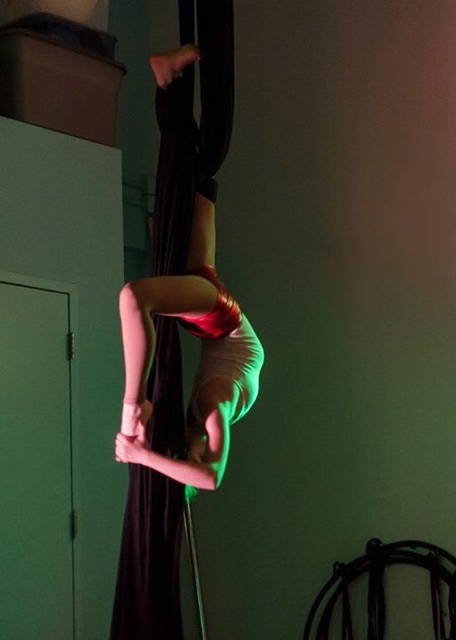 After my first studio stopped offering aerial silks classes, I tried volleyball, basketball AND track and field all in my freshman year of high school. However, none of these suited my need to climb, bend, and work creatively. 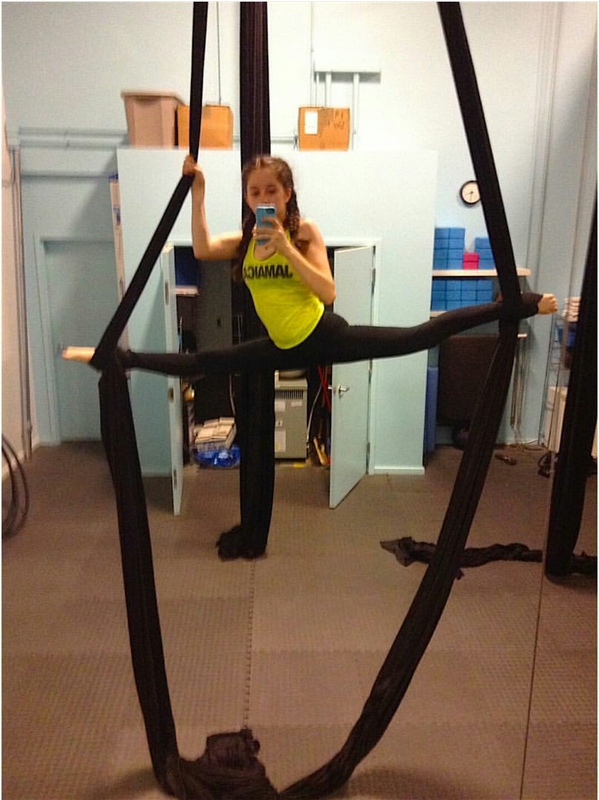 That summer, I found Sky High Studios and took my first silks class after an entire year without silks! 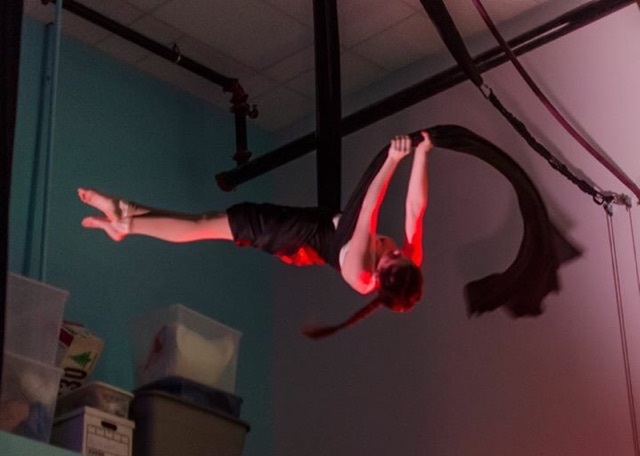 Not only did aerial silks give me the opportunity to do an extra-curricular, but I became part of a community of aerial artists and aspiring circus artists. In addition, aerial silks have hugely improved my confidence and overall ambition to be the best that I can be in any aspect of life. My favorite thing about silks is turning moves into spinning moves, and dropping in series of combos. After seeing aerialists performing during a vacation, I immediately fell in love with the beauty and grace of aerial dance. 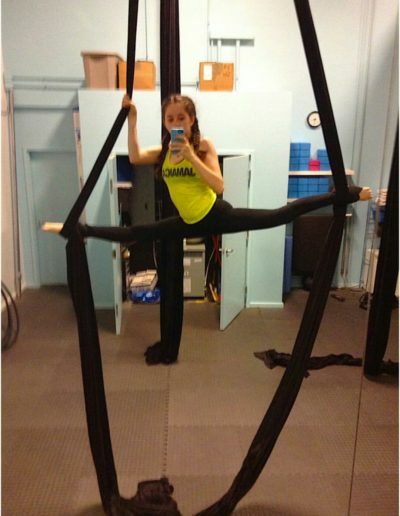 Shortly after, I began taking aerial silks classes at a gymnastics studio close to my home, just after my fourteenth birthday. It was love at first drop 😉 I’m 17 (almost 18!) now, and aerial silks is the biggest part of my life. If you’re not having fun, laughing, and visualizing your future as an aerialist, I’m doing it wrong and please chuck a yoga block in my direction. My ambition is to give each and every student the absolute best experience in class by combining elements of strength and flexibility training with fun and encouragement to use self-expression and personal style with each and every skill they learn. NOTHING is impossible when you are set to achieve! Outside of the studio, I’m a 17…almost a legal adult!…year old in my senior year of high school studying through AP classes as I get ready for college. Yippee! As a student at a vocational school, I’m training in a Masonry program within my school (they call me Mini Mason), to do all things masonry and landscape. Outside of school I train in aerial silks with the mindset to be a professional performer one day! Besides being a Mason, have a huge passion for the culinary aspect, meaning I like to eat, a lot. Want to set up a private lesson? Contact me!